Today I am pleased to welcome Jacob of Dollar Dilligence. His focus is not only teaching your children about finances, but all of us. Although many people find the subject daunting, financial education does not have to be complicated. Parents, grandparents, friends, and teachers can help kids learn these skills with simple methods. The earlier we teach our kids about money, the better they will be able to handle their finances as adults. 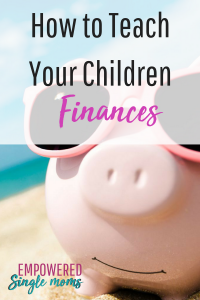 The first step in teaching your children about finances is to include them in the conversation. 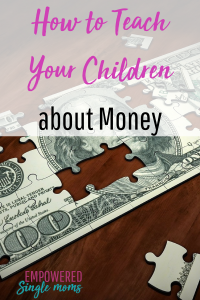 Many parents avoid talking about money with children because they believe it is inappropriate or something that children shouldn’t have to think about. Kids don’t need to know every detail of their parents’ finances, but they can be involved in an age-appropriate way. For example, if they understand that you have to pay so much each month for basic utilities, it will help them grasp that you do not have an unlimited supply of money. Showing them a simple budget demonstrates that we all have to make decisions about how to spend our money. Next, consider giving your child an allowance. An allowance is an opportunity for kids to budget with their own money. They will know exactly how much money they will receive and when they will get it, which will give them the chance to plan their spending. You can tie the allowance to chores or use the allowance only as a teaching tool. Put portions of an allowance into separate jars to help your kids achieve different goals, such as save, spend, give, and invest. As your kids get older, you can include them in more household financial decisions. Showing children how much comes in as monthly income and how much goes out in monthly expenses helps them understand how to set up their own budgets. An older child (preteen or teenager) can help decide where to trim expenses. They may even surprise you with their ability to be frugal. Talk to your kids about various financial products. Although many of us pay bills online, it is hugely beneficial to show your child how traditional checking and savings accounts work. A savings account statement illustrates the benefit of interest. Help your child understand compounding interest by opening up an account with their birthday money and watching it grow over time. Talk about using credit cards. Explain how they can be a tool to help you make purchases, but that having bad credit can make it more difficult to borrow money to purchase a car, pay for school, or buy a house. Explain credit card interest rates and how challenging it is to dig yourself out of credit card debt. Having this conversation before they are tempted by campus credit card offers will help your children avoid a debt trap. Finally, have an open and honest conversation about paying for college. The cost of higher education has skyrocketed, and for most students, paying for a degree will mean taking out loans. Talk to your kids about what you can afford to chip in for their education, and what you expect their contribution to be. If possible, get your kids started with a 529 plan or another college savings plan as early as possible to help put them on a path toward paying for college on their own. Otherwise, continue to encourage your kids to make smart financial choices by setting up a budget and using credit wisely. Teaching your children about finances will help them significantly once they’re on their own. Their financial competence will give you the peace of mind that they are fully prepared to take on the challenges of the world.